MFT Card Challenges: Thank You for a Great First Week! We are so pleased that you have taken the time to join us for creative fun. It's been such a blast getting to know you and inspiring you to play along. I predict 2015 is going to be awfully EPIC! You are making this blog an encouraging and inspiring place to be, and truth be told, because of you my world is brighter! I'm kind of obsessed with felt and blanket stitching. Still learning! 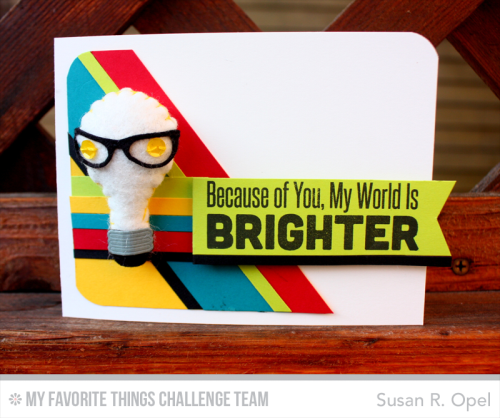 The card above is a combination of our Wednesday Sketch Challenge and our MFT Color Challenge that opened up this week. Click on the logos below to see how you can participate in one or the other or BOTH! You can also check out the Meet the Team tab for quick links to their blogs and fun information about the six of them (and me!). I'm a former teacher and cheer coach, so I have some homework for you! Bookmark our blog (and those of the MFT C&I Team) so you don't miss a thing! Join our MFT C&I Facebook Group to connect with like-minded creative friends. 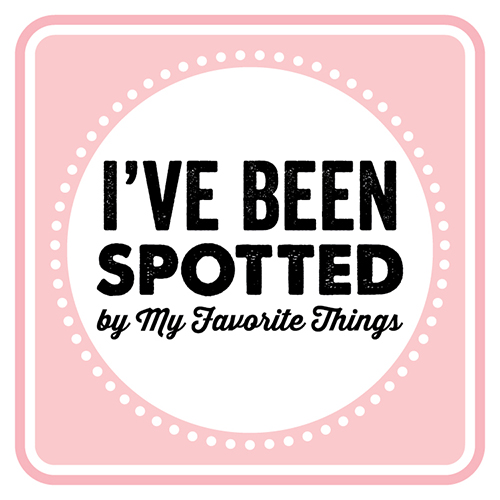 Shop the My Favorite Things Boutique - You. Know. You. Want. To. Participate in the challenges. What do you have to lose? Share your work on your blog, Flickr, via Instagram, Facebook, and Twitter. Use the hashtag #mftstamps, and you just might be Spotted! 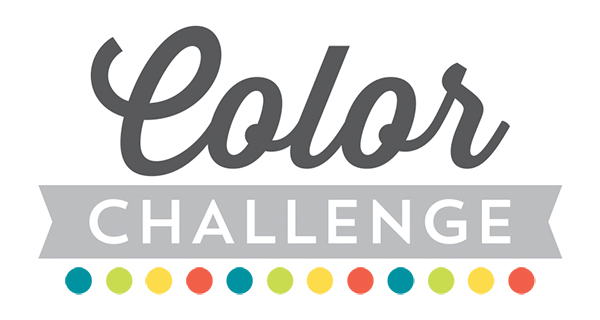 Do you love what's going on here at the MFT Challenge & Inspiration blog? Share it! The more the merrier. And don't forget to pin all of the inspiration on Pinterest! Whew! So much fun! I'll meet you back here next Wednesday with Sketch 211, more inspiration from the team, and a whole lot more crafty goodness. In the meantime, I'm off to sunny skies in Anaheim, CA, for the Craft & Hobby Association trade show where I'll be representing My Favorite Things. I'll be connecting with creatives and companies to bring you more of what you love about MFT. 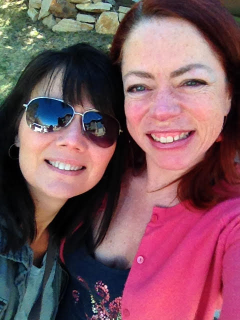 I'll be hanging out with this fabulous lady - the one and only Laina Lamb - stamp designer for My Favorite Things. Her stuff is pretty much AWESOME, just like she is! If you're there, be sure to say hello! Before I go, I have one more project to share using the brand new All My Love Die-namics from Lisa Johnson Designs. I cut the heart in MFT's Paver Red felt, a color that comes close to Pantone's 2015 Color of the Year - Marsala. I blanket stitched the edges (see? obsessed) and stuffed it to make a puffy Heartfelt Pincushion. Because I puffy heart that you are here with us! Now go make something pretty, and see you next Wednesday! omgosh, all your felt is making me friggen swoon. I hate sewing but you may get me to step outside my tiny box! Have fun at CHA - I am going to miss seeing you and all the fabulous people there! Cute card Susan!!! Gotta love that lightbulb with the glasses! 2cute!! 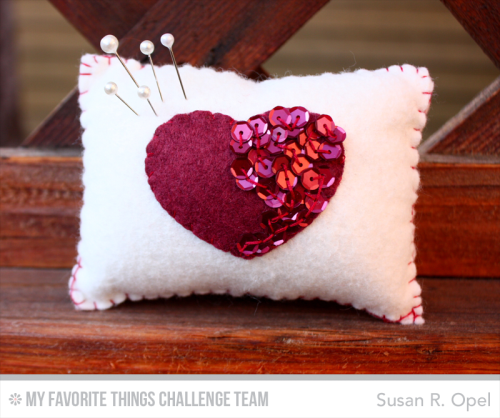 I puffy heart that pin cushion, it's absolutely precious! OMGosh your projects are ADORABLE. Thanks for sharing.